With an increasing number of apartment blocks being developed in our major cities and suburbs, small dogs are becoming more popular with pet owners in Australia. However, it might surprise you to know that small breeds don’t always make the best pets for apartments and often require more exercise and mental stimulation than larger breeds who spend most of their time in a backyard. But with training and the right amount of mental stimulation, any breed of dog – whether small, medium or large – can adapt to living in high density housing. Australians love their companion animals and with more than 33 million pets on the continent, pet ownership in Australia is among the highest in the world¹. Having a high pet to person ratio in Australia wasn’t a problem when most of us lived in free standing dwellings and we didn’t have to abide by the default ‘no pets allowed’ rule enforced by most strata schemes. However, with more of us now living in high and medium density housing, State Governments and Territories are stepping in to restrict strata schemes from unreasonably banning pet ownership in apartments, villas and townhouses. For example, as of July 1 2016, apartment owners in New South Wales will have the green light from the NSW State Government to have a small dog under 14kgs living with them in such a dwelling. Interestingly, dogs in apartments can often do much better when it comes to behaviour, manners and social opportunities than their buddies who have a backyard to run around in. This is because unlike backyard dwelling dogs, apartment owners typically take their dogs outside for walks regularly, and they make sure they are well-trained and able to behave indoors. Dr Liisa Ahlstrom, Technical Services Veterinarian for Bayer Australia’s Animal Health division, believes that if dogs get the correct training and mental stimulation while home alone, all breeds can adapt to living in an apartment, but some are obviously more suited than others. 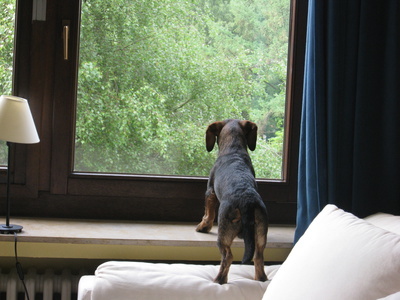 “It may surprise you to know, that small breeds such as Terriers need large amounts of exercise, whereas a Great Dane doesn’t, so the cliché of a small living area means you must have a small dog doesn’t always ring true when it comes to picking the right dog for your apartment,” says Dr Liisa Ahlstrom. 1. Toys – rotate your dog’s toys regularly (otherwise they will lose interest) and remove the majority of them when you come home – this way your dog will look forward to you leaving, as that’s when the toys come out. 2. Consumables – leave a pig ear/sheep’s ear, large meaty raw bones, grass & herb garden or dog treats in ice-cubes floating in large water containers in easy reach, as these consumables keep your dog busy and fed. Remember to ask your vet what he/she recommends for your dog as some treats are not suitable for all dogs. 3. Sounds – when appropriate and pending budgetary/ eco-living constraints, leave the television or radio on to give your pet dog a sense of company as this is likelier to keep dogs calm. 4. Smells – collections of ‘smelly items’ from an outside environment, calm pheromone diffusers or an old t-shirt of owners your pooch can keep in their bedding will stimulate their senses when alone. 5. Puzzles and games – leave a treasure hunt for your dog to find treats or toys hidden all over the house. For dogs that stay largely in one area, the same can be achieved by filling a clam shell filled with shredded paper for an indoor treasure dig. 1. Pet Ownership Statistics, Australian Companion Animal Council Inc (accessed 12 November 2015).